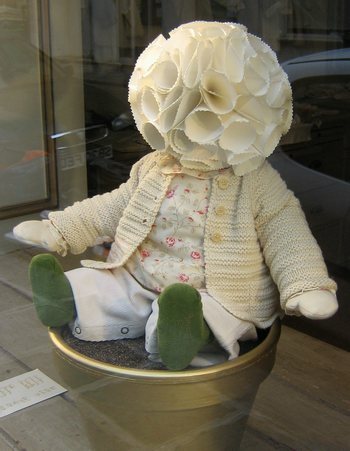 Shop windows in Paris are full of surprises. 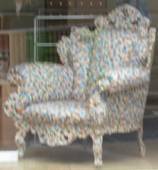 This armchair in a shop window on the rue de l’Université costs 8,584 euros! 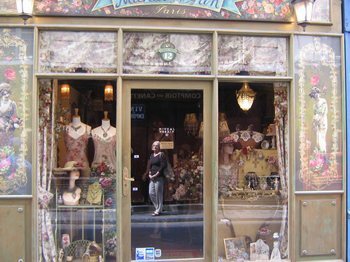 Lovely shop façade, with my friend Carol’s reflection in the door. For all of its faults and weaknesses, the tabloid newspaper Le Parisien provides useful information for those of us living here in Paris, and it does not fail to examine weaknesses in French society. Every summer I have read at least one interesting article in Le Parisien about racism in France. In yesterday’s edition, in a sidebar accompanying a critical review of the new Miami Vice movie, was an interview with Isaach de Bankolé, one of the actors in the movie. Isaach is black, and he is French. He was born in Ivory Coast, and his parents were “béninois.” In addition to his role in Miami Vice, he is going to be in Casino Royale, the next James Bond movie. He is 49 years old. How did you decide to exile yourself to the United States? Between 1991 and 1998, I lived in Paris but I only found work in foreign films. So, I told myself that it would be better for me to go and try for a future elsewhere, such as the United States. I was nevertheless an unknown there. I was already a friend of Jim Jamush and Jim Stark, his producer. They put me in touch with an agent. And then I fell in love (editor’s note: with the jazz vocalist Cassandra Wilson, with whom he is now separated). Is it easier for a black actor in the United States than in France? In the United States, it is clear: one has notably more options when one is part of a minority than one has in France. The people listen to you more. In what could seem paradoxical for an African actor, I read many more scripts that interest me in the United States than in Paris, even if there is a much larger black African community in the Paris region than in New York. Here (in New York) I always have work. I make more castings and one thing leads to another. In Paris, it was only on the day that I added a “de” in front of my last name and started calling myself “De Bankolé” that I was able to find an apartment! What do you have to say about your role in the next James Bond movie? My character is named Obano. He is a warlord, a bit in the image of Joseph Koney in Uganda. I am one of the bad guys in the film. I have had great pleasure in working with Daniel Craig. He is a basic kind of guy and he has an incredible simplicity. The people who have doubts about his capabilities in playing the role of 007 are going to be surprised. This Paris Journal is composed on a Dell Inspiron 5100 laptop computer. I am happy to report that it does not have the kind of battery that bursts into flames.